Info "Get your instrument in tune by aligning the needle and the center." Stay Tuned is one of Penny's Microgames in WarioWare: Smooth Moves. The name of the microgame is a pun on the phrase "stay tuned", meaning "stay watching". The player must tune the instrument by aligning it in the red zone. 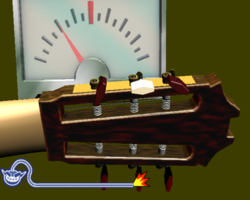 1st level difficulty: A normal guitar. 2nd level difficulty: A bass guitar. 3rd level difficulty: A violin. This page was last edited on February 20, 2018, at 16:34.